Ever since I was young, I have loved the shores of Waimānalo on O‘ahu’s east side. For me, it always has been (and always will be) the most incredible place on earth – breathtaking turquoise waters and long stretches of white sandy beaches. At first light, when the ocean hasn’t yet laid claim to its own vivid hues, it borrows instead from the glorious gold palette of the sky above and I am unfailingly gripped with a sense of timelessness, in tune with souls who have once stood where I now stand, who over the years have gazed out over the waters of Waimānalo. They must have felt as truly humbled and awed by its sheer beauty as I. I thank God for my gift of vision and I pray that I shall never take for granted the glory of creation! Great, sweeping lines of ironwood trees loom up over the beaches of Waimānalo, mysterious pine-like giants that stand like silent sentries along the shorelines, their long wispy “needles” lifting and drifting in the sea breezes. A spongy carpet of dried “needles” and little cones lies below (…a rather barren carpet since not much else can survive beneath these imposing trees). The word for ironwood in the Hawaiian language is paina, which translates to “pine.” However, despite their resemblance to pine trees, they are not evergreens. Nor are they native to the Hawaiian Islands; the ironwoods (also known as Casuarina) were introduced in the late 1800’s to early 1900’s to stabilize the sand along the shorelines. None of this is relevant at all to Hawaiian slack key guitar other than time and place; the two just “took root” and “grew up” together. I like to think of it that way because it was during this same period of history in Hawai‘i, (the late 1800’s to early 1900’s), that Hawaiian slack-key guitar was introduced. Kī Hō‘alu (which means “loosen the tuning key”) is believed to have started in the time of the Mexican paniolo (cowboys) who taught Hawaiians the basics of guitar playing before they left. Hawaiians began to develop their own style of tuning, the first and last strings being tuned to D instead of E, leaving an open chord [usually G]. The strings are plucked individually rather than chorded. There was a burgeoning popularity of Hawaiian music with mainland audiences in the early 1900’s, music which featured ukulele and steel guitars. However, Kī hō‘alu was a style that somehow stayed private to backyard kanikapila gatherings and ohana times. Gabby was born on the leeward side (1921) of O‘ahu but eventually settled with his family in Waimānalo. While skilled at playing steel guitar, he ultimately became known best for both his mastery of slack-key guitar (tutored by Herman Keawe) and the legendary weekend long jam sessions in his Waimānalo backyard. From 1946 to 1947, Gabby released a series of recordings that brought that hitherto private tradition into the public eye. It was during the 60’s and Hawaiian Cultural Renaissance of the 70’s, that Hawaiian slack-key became very popular with many musicians and recording artists – largely due to Gabby Pahinui and his influence. Its continued popularity in evident in that the first four winners of the Grammy Award for Best Hawaiian Music Album were slack-key collections. 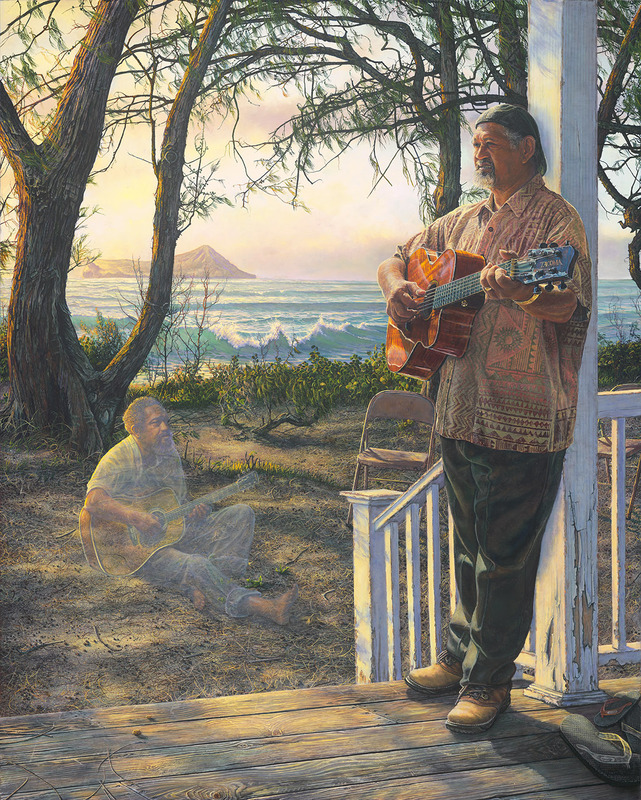 This painting presents Cyril Pahinui (famous today for his mastery of Hawaiian slack key guitar and his gentle compelling vocals) with the spirit of his father, the great Gabby Pahinui, beneath the ironwood trees on a Waimānalo beach overlooking Rabbit Island. The legend lives on. Kī Hō‘alu a me nā lā‘au paina – slack key and ironwood trees…no ka poli mai nō ‘o Waimānalo.